The renowned sitar player Ravi Shankar has died aged 92 after undergoing surgery in the US. World famous for his mastery of the sitar as well as his association with The Beatles, Shankar played a crucial role in introducing Indian classical music to the west. Born in Varanasi in 1920, Shankar gave up an early career as a dancer to study the sitar, training under Indian classical master Allauddin Khan. He went on to collaborate with many musical greats, including John Coltrane and Yehudi Menuhin, although it was his relationship with Beatles guitarist George Harrison that propelled Shankar to international fame in the mid '60s. His tuition of Harrison and influence on The Beatles caused an explosion of interest in Indian music in the west. Shankar went on to perform at Woodstock and the Concert For Bangladesh, becoming the most recognisable exponent of Indian classical music throughout the world. The winner of three Grammy awards, Shankar was also awarded the highest civilian citation in India, the Bharat Ratna (Jewel Of India) in 1999, and was a Knight Commander of the Order Of The British Empire. Indian Prime Minister Dr Manmohan Singh's office called Shankar a "national treasure and global ambassador of India's cultural heritage" via twitter. Dr Singh added: "An era has passed away with Pt. 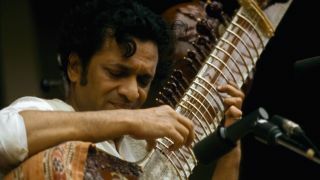 Ravi Shankar. The nation joins me to pay tributes to his unsurpassable genius, his art and his humility."